If you've ever felt the need for an extra finger or two on your fretboard, new single-string capos Fretlocks could be the accessory you've been waiting for. 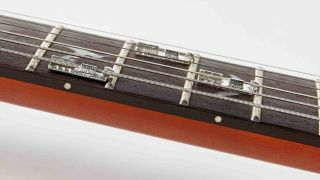 Fretlocks simply stick onto your fretboard and two tiny blades 'fret' the string - there are three different sizes of Fretlock dependent on string gauge. This offers up opportunities for new chord shapes and licks that would previously be impossible - Fretlocks' founders are encouraging players to join their 'Freternity' to share how they use the accessory. Fretlocks are available from late September via the Fretlocks site for £15 per pack of six and £25 for a limited-edition tin of 12.